Postcodes are used in Australia to more efficiently sort and route mail within the Australian postal system. 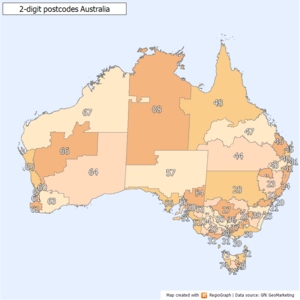 Postcodes in Australia have four digits and are placed at the end of the Australian address. Postcodes were introduced in Australia in 1967 by the Postmaster-General's Department and are now managed by Australia Post, and are published in booklets available from post offices or online from the Australia Post website. Australian envelopes and postcards often have four square boxes printed in orange at the bottom right for the postcode. These are used when addressing mail by hand for Australian delivery. Postcodes were introduced in Australia in 1967 by the Postmaster-General's Department (PMG) to replace earlier postal sorting systems, such as Melbourne's letter and number codes (e.g., N3, E5) and a similar system then used in rural and regional New South Wales. The introduction of the postcodes coincided with the introduction of a large-scale mechanical mail sorting system in Australia, starting with the Sydney GPO. By 1968, 75% of mail was using postcodes, and in the same year post office preferred-size envelopes were introduced, which came to be referred to as “standard envelopes”. Postcode squares were introduced in June 1990 to enable Australia Post to use optical character recognition (OCR) software in its mail sorting machines to automatically and more quickly sort mail by postcodes. When writing an address by hand, and a row of four boxes is pre-printed on the lower right hand corner of an envelope, the postcode may be written in the boxes. If addressing a letter from outside Australia, the postcode is recorded before 'Australia'. Australian postcodes are sorting information. They are often linked with one area (e.g. 6160 belongs only to Fremantle, Western Australia). Due to post code rationalisation, they can be quite complex, especially in country areas (e.g. 2570 belongs to twenty-two towns and suburbs around Camden, New South Wales). The south-western Victoria 3221 postcode of the Geelong Mail Centre also includes twenty places around Geelong with very few people. This means that mail for these places is not fully sorted until it gets to Geelong. Some postcodes cover large populations (e.g., postcode 4350 serving some 100,000 people in Toowoomba and the surrounding area), while other postcodes have much smaller populations, even in urban areas. Australian postcodes range from 0200 for the Australian National University (now 2601) to 9944 for Cannonvale, Queensland. Many large businesses, government departments and other institutions receiving high volumes of mail had their own postcode as a Large Volume Receiver (LVR), e.g. the Royal Brisbane and Women's Hospital has the postcode 4029, the Australian National University had the postcode 0200. More postcode ranges were made available for LVRs in the 1990s. Australia Post has been progressively discontinuing the LVR programme since 2006. Some of the postcodes above may cover two or more states. For example, postcode 2620 covers both a locality in NSW (Gundaroo) as well as a locality in the ACT (Hume), and postcode 0872 covers a number of localities across WA, SA, NT and QLD. Three locations (Mingoola, Mungindi and Texas) straddle the NSW-Queensland border (so same town name and postcode on both sides). Jervis Bay Territory, once an exclave of the ACT but now a separate territory, is geographically located on the coast of NSW. It is just south of the towns of Vincentia and Huskisson, with which it shares a postcode. Mail to the Jervis Bay Territory is still addressed to the ACT. The numbers used to show the state on each radio callsign in Australia are the same number as the first number for postcodes in that state, e.g. 2xx in New South Wales, 3xx in Victoria, etc. Radio callsigns pre-date postcodes in Australia by more than forty years. While the first number of a postcode usually shows the state or territory, the second number usually shows a region within the state. However, postcodes with the same second number are not always next to each other. As an example, postcodes in the range 2200–2299 are split between the southern suburbs of Sydney and the Central Coast of New South Wales. Postcodes with a second number of "0" or "1" are almost always located within the metropolitan area of the state's capital city. Postcodes with higher second numbers are usually located in rural and regional areas. Common exceptions are where towns were rural when postcodes were first introduced in 1967, but have since been suburbanised and incorporated into metropolitan areas, e.g. Penrith, New South Wales has the postcode 2750 and Petrie, Queensland has the postcode 4502. Major towns and cities tend to have "0" as the last number or last two numbers, e.g. Rockhampton, Queensland has the postcode 4700 and Ballarat, Victoria has the postcode 3350. There are exceptions; the major town of Ipswich, Queensland has the postcode 4305, while Goodna, a relatively unimportant suburb of Ipswich, is allocated 4300. Australia Post prefers envelopes sold in Australia to have four boxes in the bottom right corner of the front of the envelope. Entering the postcode in these boxes or squares, which Australia Post calls postcode squares, enables Australia Post to use optical character recognition (OCR) software in its mail sorting machines to automatically and more quickly sort mail into postcodes, which also embeds routing information. Postcode squares were introduced in June 1990. Australia Post says that postcode squares should not be used for machine-addressed mail, or mail going overseas. Many other organisations now use postcodes. Insurance companies often use postcodes when working out the cost of car and house insurance. The NSW Ministry of Transport uses postcodes to give specific numbers for each bus stop in Greater Sydney. The stop number is five to seven numbers: the first four are the postcode, and the others show the bus stop (sometimes written with a space in between, e.g. "2000 108"). Many companies that produce metropolitan street maps also list the postcodes for each suburb, both in indexes and on the maps themselves. Spatial representation of postcodes is also very popular in defining sales and franchise territories. To improve mechanised sorting, each address now has a sorting number which is printed on the letter as an orange-coloured barcode. This number might be 12 numbers long. This system enables the post office to place items in delivery order. Companies can also use Rapid Addressing Tool(RATS) to print Customer Addressed Barcodes, which are printed above the address. Every Delivery Point in Australia (DPID) has its own number. Barcode Sorter (BCS) machines sort and sequence letters up to C5 size. MARS sequences letters up to C5 articles. Flat multi-level OCR (FMOCR) reads, imprints and sorts C5- to A3-size articles. ^ a b Daniel Vidoni. "History and Assignment of Postcodes". Store Finder. Retrieved 24 January 2016. ^ Alford, John (2009). Engaging Public Sector Clients: From Service-Delivery to Co-Production. Palgrave Macmillan. p. 86. doi:10.1057/9780230235816. ISBN 978-1-349-30872-9. ^ Post, Australia. "Mingoola Postcode". auspost.com.au. Retrieved 2019-02-28. ^ Post, Australia. "Mungindi Postcode". auspost.com.au. Retrieved 2019-02-28. ^ Post, Australia. "Texas Postcode". auspost.com.au. Retrieved 2019-02-28. ^ "Australian Postcodes User Guide". All Things Spatial Blog. 21 September 2010. Retrieved 15 December 2013.